I ordered the pale ink bath mat & like it very much. It is thick, feels good on bare feet & the light pastel pink is very pretty. The Mohawk Home Bath Rug Collection pairs easily with todays home fashions. 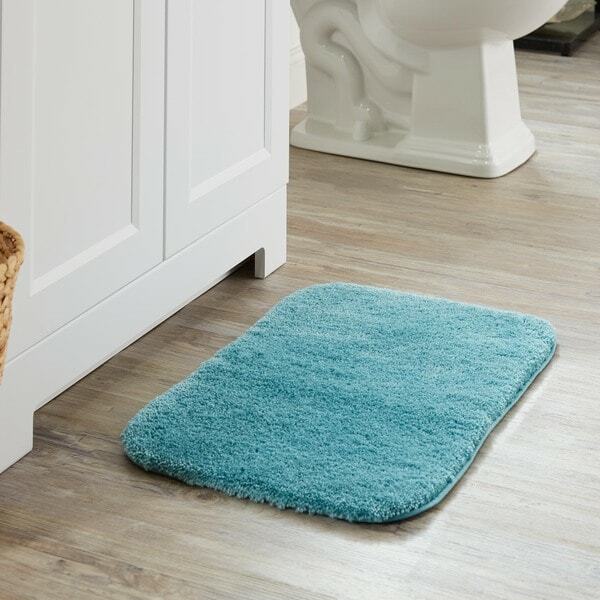 Quality crafted from nylon fiber for the ultimate in softness, these mats will add a welcome layer of comfort to your bathroom floor. Additionally, a skid resistant backing helps to keep these rugs securely in place. Outfit your bathroom with softness and durability. Machine wash separately in cold water using mild detergent. Use only non-chlorine bleach when needed. Tumble dry on low setting. Love this fluffy rug! Even after a couple of washes, it still looks and feels like brand new. I purchased a second set for our guest bath. I highly recommend this line of rugs. I was looking for this rug size previously and couldn't believe when I finally saw it online. The rug is a perfect size for my needs. It's plush, looks great so happy to have found it. Highly recommend it to anyone looking for a plush area rug. See review for 1’8x2’10” rug. I love the color. It is hard to find yellow/gold colors in bath products. So I know to purchase them when I find them. I like the feeling of the rugs. Beautiful rich color and non skid bottom. I love it!!! This rug has good qualities including color, softness and size. I received my purchase in a timely manner and I was quite satisfied with the whole experience. Very nice color and quality. Fits perfectly and washes well. I bought the whole set and plan to buy another soon to change colors for the fall. I am happy with my selection. Love these rugs. They are soft and plus. I really like this rug. The shipping was early and the packaging was great. The color was true and it matches the set. Will order this brand again . Needed a lime green rug,just what I needed.the color is perfect.great buy I will highly recommend it. Nice quality. Color is perfect. Way overpriced for quality. Plus I received the wrong size twice. Overstock.com used to be better. This was purchased as a gift, but I do know it was very soft and plush. "What color do I order for the aqua blue?" You would choose the teal option.